Last week, something awesome happened. 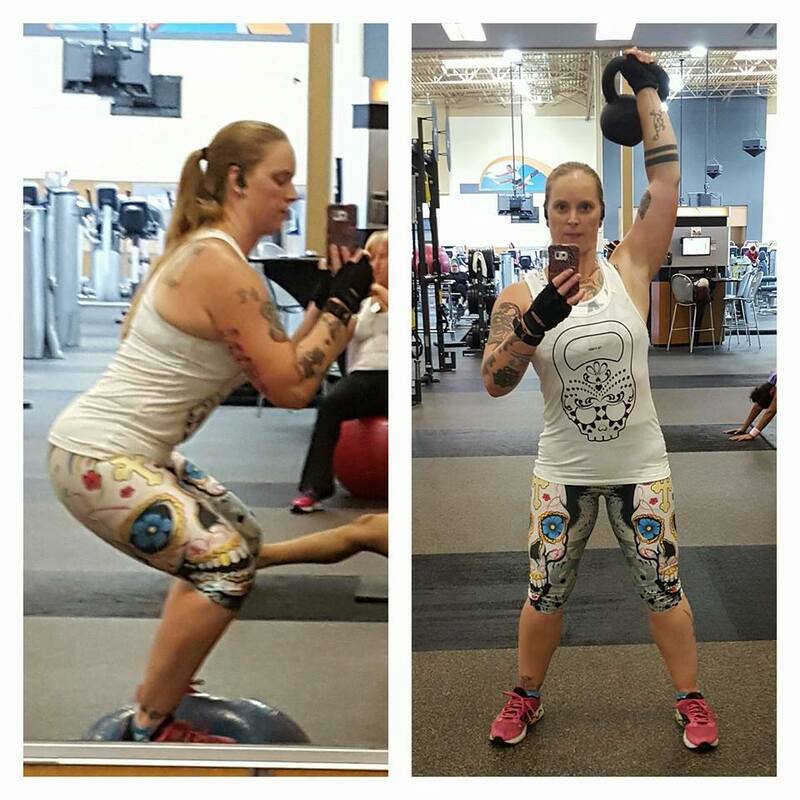 I hit my goal weight! However, I still have a very soft appearance around my midsection and have some excess “fluff” going on, plus my body fat is still around 34%. A healthy average body fat for a woman is 24-31%. So, I have a new, revised goal. I want to get my body fat below 31%. I’m going to start that off by readjusting my goal weight to 165. But, if I hit 31% or less before I get to 165, then I will have hit my new goal. I’m going to keep up my intense workout schedule as best as I can while picking up 1-2 shifts of overtime every week that I am able to. I had a bunch of stress on Saturday. It all started on Thursday. I got home from work and had a voice message from my apartment complex office asking me to drop off a copy of my renter’s insurance when I got a chance. I forgot to do this Friday before work and had a very nasty gram stuck into my door jam when I got home Friday night that said since I had failed to turn in my proof of insurance I was now on a month-to-month rent plan. That’s like an extra $200 a month, I can’t afford that!!! So needless to say I had huge issues sleeping Friday night. 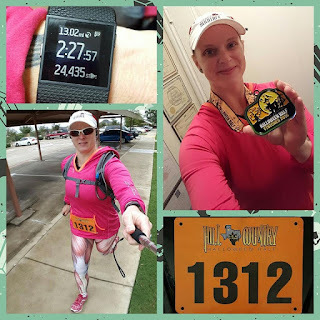 On top of that I had the Hill Country Half Marathon Saturday morning that I didn’t know if it was going to get canceled or we were going to have to run in pouring rain to worry about. I had set my alarm for 5:20am but was wide awake at 4am and was obsessively thinking about it the whole time. I changed my mind about my outfit. I would no longer wear my costume, but I would wear my muscles & tendons leggings with a hot pink Reebok pullover with a hood, and most likely my red poncho over it all. I got out of bed after my alarm went off and gathered all my stuff and got ready and headed to the start location. When I arrived at the start location and checked my email, I discovered the email from Penteli Events stating the race was canceled. So I drove home and wasted time until I could go pick up my medal, shirt and bib from the running store and then drop off my proof of insurance. Good news, I wasn’t actually placed on that month-to-month status, it was just a blanket form letter they had sent out to everyone else. I then ran some more errands and ate some semi-healthy homemade nachos, then laid down on the couch and proceeded to sleep for 3 solid hours. And now let’s get started with how this week has gone! • Saturday: I was supposed to run a half marathon, but it got canceled. I was then going to run 13.1 on my own and “earn” my medal that I still received, but ended up exhausted and asleep on the couch all afternoon. 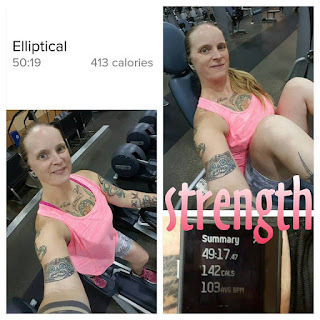 So, I went to the gym and did 50 minutes on the elliptical plus about an hour of strength training with my machines workout. I have to make sure that the weight I lose is fat loss and not muscle loss…I have to do my strength training!!! 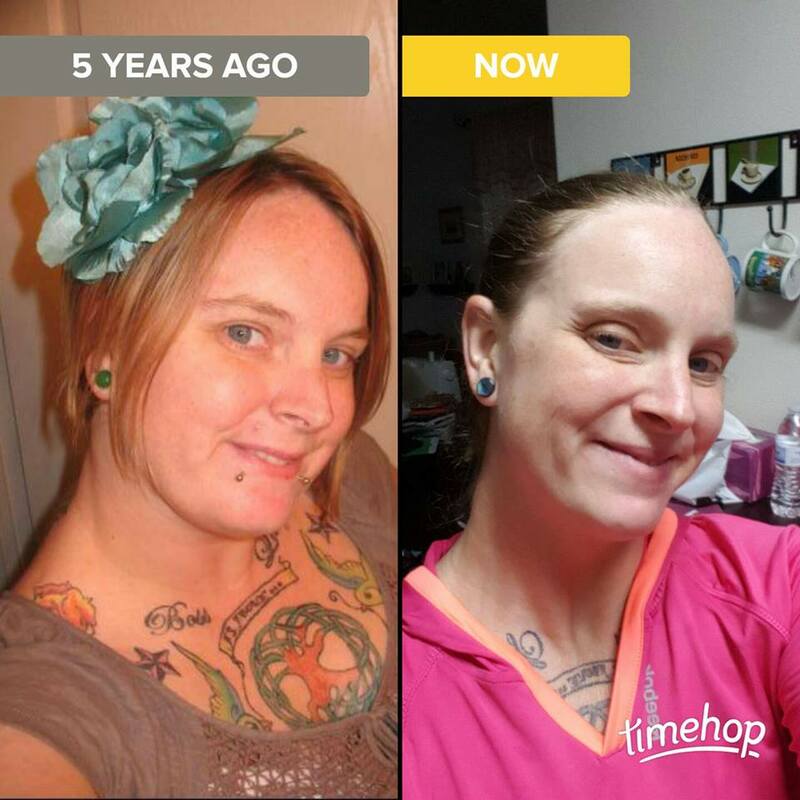 Also, Timehop had a selfie throwback for me, so I did one of those "then and now" split screens with it! What a difference 5 years makes. Don't you agree? 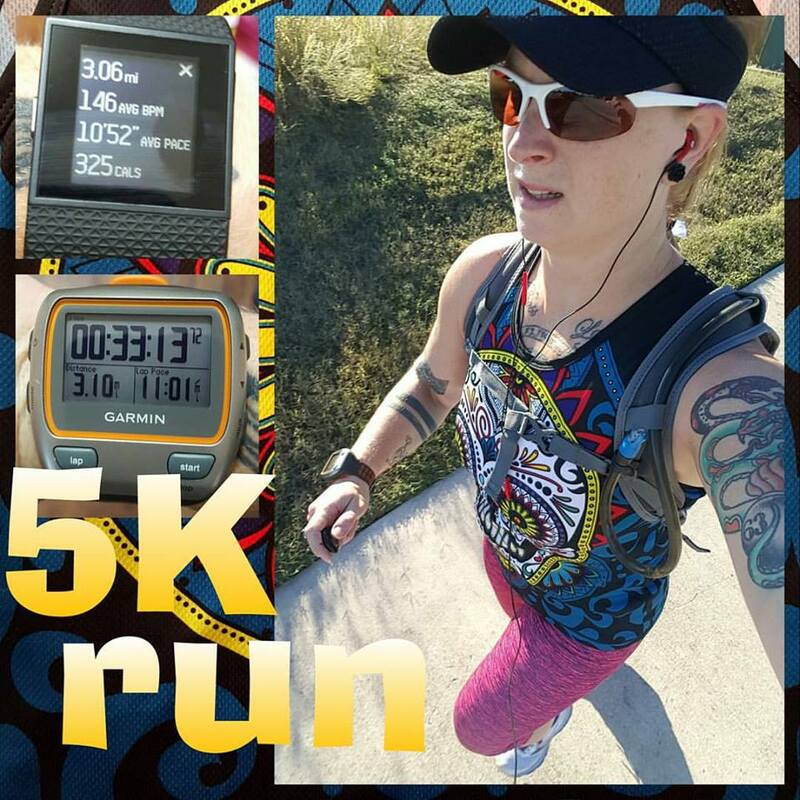 • Sunday: since I didn’t get my now virtual Halloween Half Marathon ran Saturday, I decided to get it done this day. I slept late as I had gone to a Halloween party Saturday night and stayed longer than I had meant to waiting on the awards for best and sexiest costumes. Sadly, I didn’t win. And, between you and me, I think it’s a crock I didn’t win one of them. But whatever, I digress! 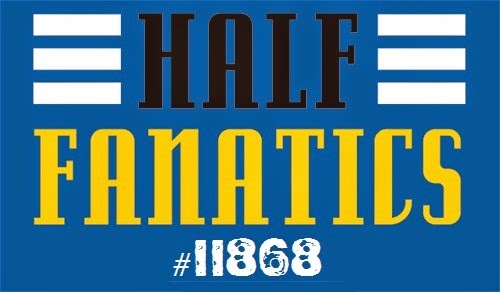 I got my half marathon ran this day in the afternoon. It was in the low 60’s so it was really nice running weather. Not raining, but a little windy. Perfect, really. I just ran at a pace that felt “comfortably hard” to me which ended up being an overall pace of 11:17 per mile. 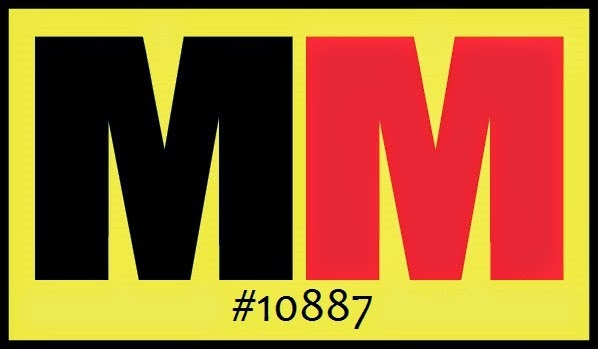 • Monday: "You can't get the results you want without putting in the work it takes to get there." 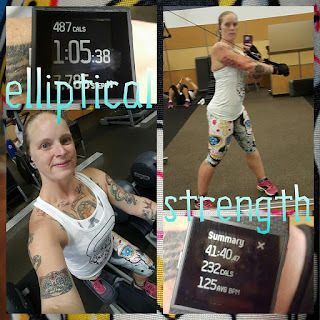 Had a little hitch on this morning as 1) I had no idea what workout(s) I wanted to do today and 2) I didn't feel like doing anything...you know the whole "I ran a half marathon yesterday, I earned a day off" thoughts? 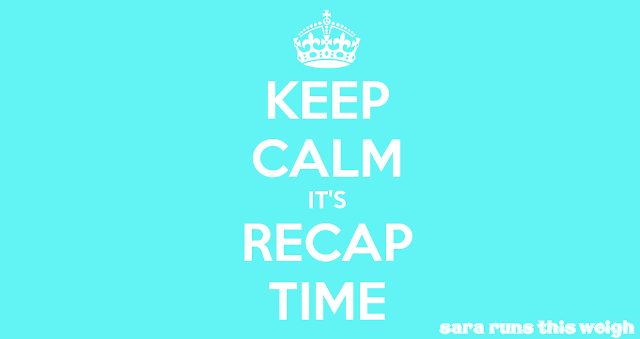 Yea, those were happening. But, I pushed thru them, settled on an hour on the elliptical (did 5.15 miles) and my freestyle gym workout. I took out the ropes and added ab tucks on the TRX straps. • Tuesday: [mental] therapy day! I had a nice, easy 5K run this morning! It was originally going to be just 3 miles, but right as I hit “start” on my FitBit and my Garmin, my Bluetooth earphones died. So, I ran the .1 of a mile from the front of my apartment complex to the base of the stairs at my building, retrieved my ear buds and put my earphones on the charger, then ran back to the front of the complex and started my run. I’m not complaining at all. I remember back when I first started running and I would add on an extra .1 or .2 or point-whatever to my runs whenever I could just to make that monthly mileage add up and add up! Then, after my run, I got ready and left to park at work and do my walking pre- and post-therapy appointment. Got in a little over 2.5 miles of walking done. 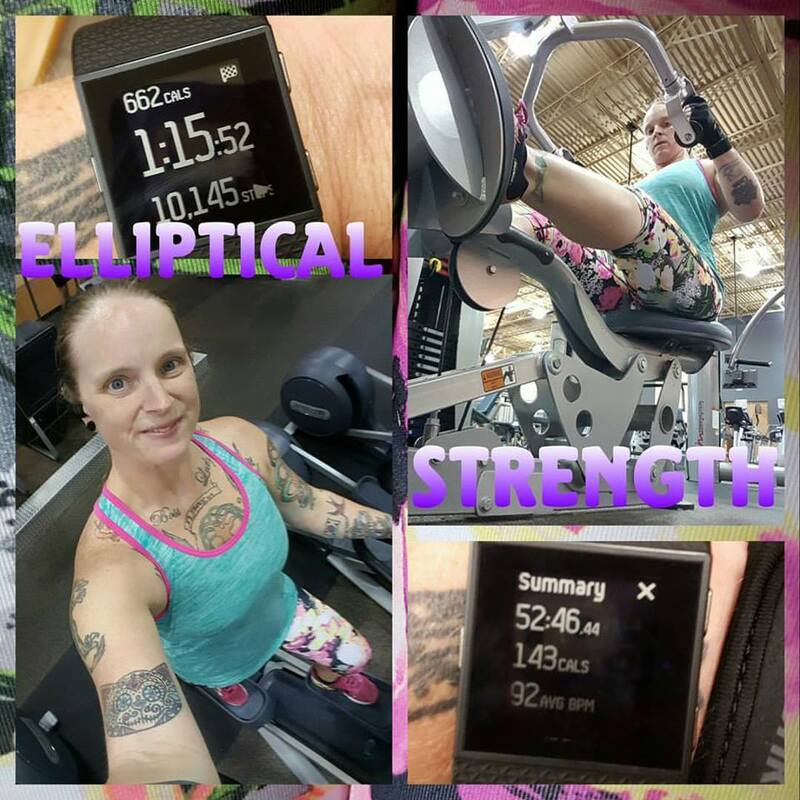 • Wednesday: I worked overtime on the night shift Tuesday night, so no workout this day. • Friday: I had this day off work. I had asked for it off because I was wanting to run a half marathon in San Antonio today (Saturday), but the feedback I got from my supervisor told me that I wouldn’t get the time off, so I didn’t register for the race and now I just have a free day off. So I used it to catch up on some stuff. went to the gym again, did an hour and 15 minutes on the elliptical for 6.3 miles and followed up with my machines workout. I mentioned I went to a Halloween party last Saturday and that my costume didn’t win me any award. But, even though I didn’t win an award, I did win an awesome compliment from the hostess! She told me I looked amazing. At first, I thought she was referring to my costume, but then I realized she was talking about my weight loss and getting into shape. She’s not someone that doles out compliments unless they are truly warranted, so her compliment meant/means a lot that she took the time to tell me that. Last Saturday I also did a cheat day. I started it all off with a cinnamon roll and a sausage, egg & cheese croissant from the donut shop. Something that intermittent fasting and calorie counting has done for me is that when I eat, it actually keeps me satisfied and I can then go hours before I get actually hungry again. I then made myself some nachos. I used phyllo dough for the chips, then cooked up some lean ground turkey seasoned with my homemade taco seasoning, mashed avocado, no salt added and rinsed black beans, diced tomatoes & onions, fat free plain Greek yogurt and a little 2% shredded cheddar cheese. They were sooooo good! I’ve never used Greek yogurt in place of sour cream before and I have to say…I really like it!!! It’s a little more sour than sour cream, but it’s a good swap. That night at the party I had chips and queso, a slice of pizza and some Halloween candy. 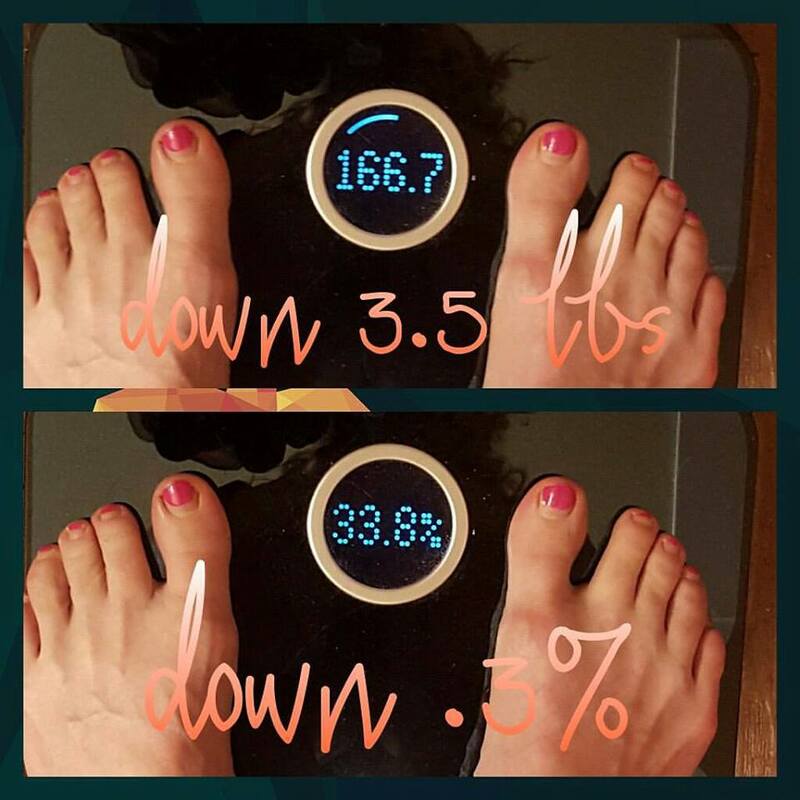 Like last week, I spent the week making sure that Saturday’s indulgences didn’t make a negative impact on this week’s scale results. But, I only had one day of indulgences to make up for instead of almost 3 as Sunday I was more than happy to eat more within my usual plans. Now let’s see how the scale looks this week. I’m seriously doing a happy dance right now. The whole time the last few years I’ve thought that 170 was as low as I could go without it becoming preventatively difficult to continue to lose and then ridiculously hard to maintain anything below 170. I knew that 3 years ago I had gotten to 172.2 and maintained it without any issue, but that no matter what I did at that time, I couldn’t get any lower. So I thought that was it and that’s why I set my goal weight to 170, not 165, or 160, or whatever. Now, here I am, at 166.7. I can’t believe it. When I hit 170.2 last week and it was easy to do, I figured that my weight loss would slow to like 1…maaaaaaaaybe 2…pounds a week. I in no way expected a 3.5 pound loss. That’s just crazy. So, that tells me that I am indeed NOT done losing weight. Plus, I want to get my body fat % into the “normal” range, so that means 31% or less. I only have 2.8% to go until I get to that normal range. I had already decided that my weight goal would go down to 165 to start, now, I’m shooting for 160. I’m hoping that 160 also equals 31% or less because I don’t want to lose TOO much weight, you know? I am excited to start the maintenance phase and not have to worry about “hitting numbers” each week. 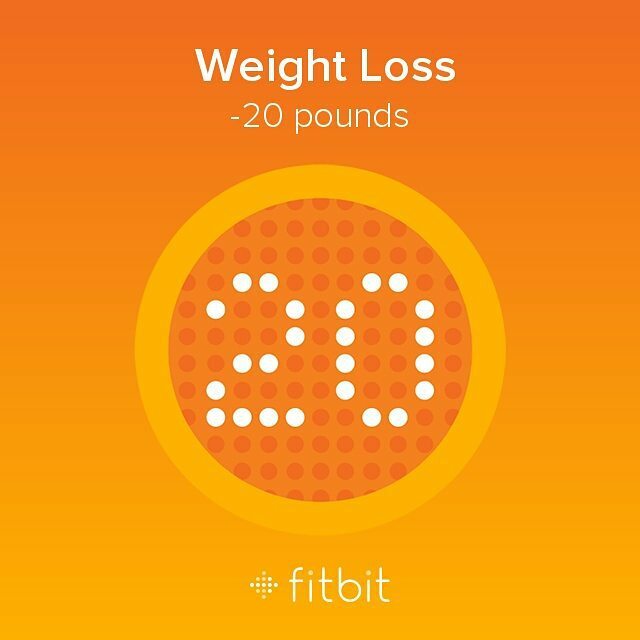 I earned the 20 pounds lost badge with FitBit. 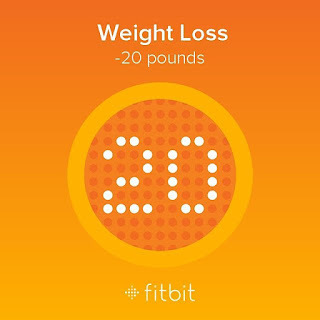 I did also earn the badge for reaching my goal weight, but I'm going to wait until I've hit my body fat % goal before I post it.